It is a dream of every girl to look like a princess on her wedding day. However, the majority of them confuses the thin body and bleached skin with beauty. Crash dieting and extensive cosmetic treatment may sometimes make them look exhausted and undernourished. Here are few tips which every bride must try to look her best on the D-day. Crash dieting and fasting can never allow you to look attractive. It is always advisable to lose weight by reducing calorie and fat intake and follow a proper exercise routine. 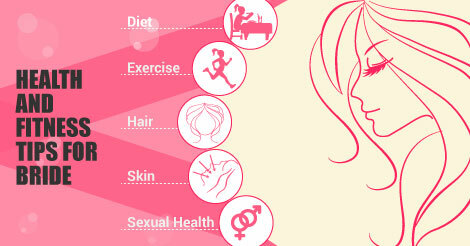 The bride-to-be must start her low-calorie and low-fat diet plan at least 3 months before the wedding. The bride must never ignore the importance of healthy diet and most importantly the breakfast. Never skip meals rather opt for smaller portion size and drink at least 6-7 glasses of water every day. Aerobic exercise like walking, running, swimming and cycling helps a lot in rapid weight loss. On the other hand, weight training helps to tone up specific areas of your body and make you look curvy. Skin needs special attention as they enhance your natural beauty. But, extensive cosmetic treatment of skin like bleaching, tan-removing, frequent facials, vigorous scrubbing, and more can leave your skin look dull and dry. It is advisable to keep your skin nourished using a good quality moisturiser, avoid prolong exposure to sunlight, wear sunscreen while out, do clean ups every week or ten days and get an herbal or fruit facial only once a month. Brides must avoid frequent hair treatments like ironing, perming, and straightening. If straightening or perming is required, it should be done only a week before the wedding. The bride must regularly oil her hair preferably with almond oil and use mild shampoos. This point is often ignored from the fitness regime of the bride. It is very much advisable for a bride to consult a gynecologist with her partner to understand the nitty-gritty of physical relationships and most importantly contraceptive methods. Knowledge about contraception can avoid unnecessary abortions and after pills intake which can be very derogatory for the general health of the women on long terms.